Surprise semi-finalist some three days earlier in Stockholm, for China’s Zhou Qihao, on Tuesday 6th November, in the city of Linz, it was start again and start at the very beginning. 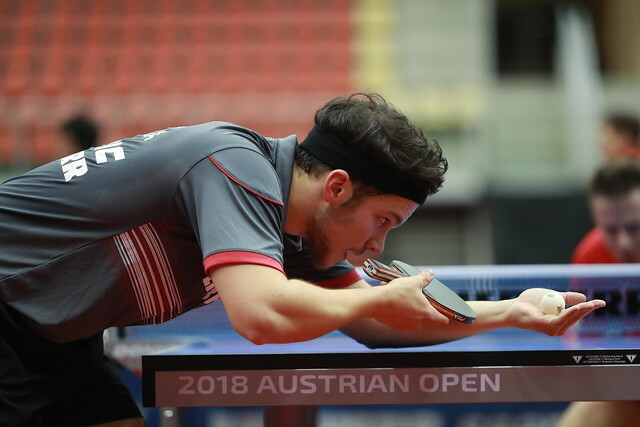 The 21 year old was in action in the opening preliminary round of the Men’s Singles event in the qualification tournament that precedes the Seamaster 2018 ITTF World Tour Platinum Liebherr Austrian Open. Furthermore, he made a most promising start in his efforts to replicate the achievements in the Swedish capital city. In his opening contest he beat Romania’s Rares Sipos (11-2, 11-6, 11-5, 11-6), a young man who is one of Europe’s major hopes for the future. It was in Stockholm that we saw Zhou Qihao blossom, the quarter-final win in opposition to Germany’s Dimitrij Ovtcharov being the result that attracted the attention. However, did we not perhaps expect Zhou Qihao to realise such results earlier? In January 2012, he won the Boys’ Singles title at the ITTF World Cadet Challenge in San Juan, Puerto Rico; later in the year colleague Fan Zhendong was crowned World Junior champion in Hyderabad. Both born in January 1997, Fan Zhendong is ten days the younger. One year later, Fan Zhendong won the Men’s Singles title on the ITTF World Tour in Poland, after winning last week in Sweden, he now owns 11 such titles, for Zhou Qihao, last week in Stockholm was his career best. Players are different, for some it takes longer that others; perhaps it is unfair to compare Zhou Qihao with Fan Zhendong who is an exception but, ever since the emergence of Teng Yi, winner of the Men’s World Cup in 1987, have not become accustomed to young Chinese players producing outstanding results? Also, there is another Chinese player of a similar ilk who we expected to hit the headlines in recent years but has been very much in the shadow, Yu Ziyang. In Linz, the 20 year old made a promising start, he opened his account with success against Saudi Arabia’s Ali Alkhadrawi (8-11, 11-6, 11-5, 11-6, 11-3). However, when we watched him play four years ago, did we not expect that four years later on the ITTF World Tour he would be a direct entry to the main draw not a player required to compete in the qualification tournament? In 2014 he won the Men’s Singles title at the ITTF World Tour Japan Open, he beat the host nation’s Jun Mizutani in the final, the win meant that only 16 years old at the time he became the youngest ever such winner. Later in the year he won the Boys’ Singles title at the World Junior Championships in Shanghai. Now just as in Stockholm there was a major breakthrough for Zhou Qihao, can there be the same in Linz for Yu Ziyang? Time will tell.